After the Brexit referendum, I saw many variations on one particular map. You know the one, it looks like this…. Which areas voted Leave? Did London vote for Remain? These graphics answer such questions instantly. But showing the results in this black and white way — IN or OUT — leaves us with no grey areas. All the muddy ambiguity has been washed out. 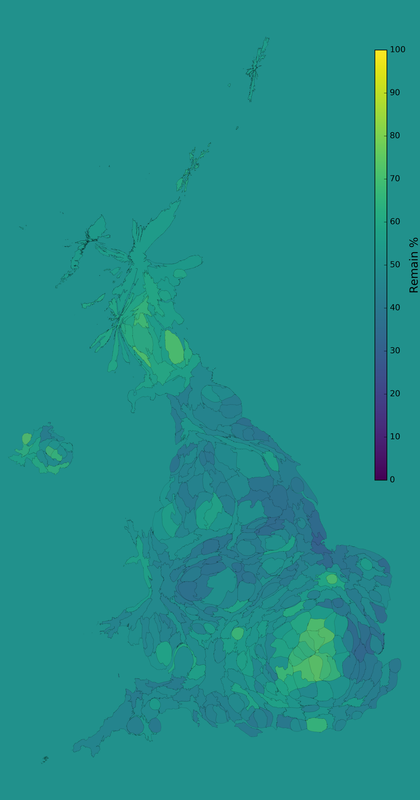 Is it possible to make a map that better reflects the mood of the country? How much information can we include on one map? Can we see how separated the Home Nations are on Brexit? Luckily, the relevant data is all easily available: the referendum results for each voting area, the map files dividing the country into voting areas, the lot. So, let’s dive in and see what we can see. Instead of using two colours I’ve assigned each individual area a colour based on how it voted. A high Leave percentage is coloured dark-blue/purple and a high Remain percentage is shown as light-green/bright-yellow. Especially strong pockets of Leave voting (around the Wash say) and Remain voting (central London) can be seen clearly. In general this map tells a more complex and subtle story. Even though Scotland and Northern Ireland voted Remain as a whole, both have areas that show less intense support, with seven of Northern Ireland’s areas actually voting Leave. Scotland seems to be visually distinct, but is this due to a high level of Remain support, or more to do with the disproportionate expanse of map it inhabits? Let’s scale the map according to population. London now takes big bulgy pride of place as the country’s largest population centre, and is now visible as a massive hub of Remain support. Scotland’s looking a mite pinched, but still certainly more yellow than the non-London parts of the UK. Poor Gibraltar has disappeared entirely. So far we’ve talked entirely about voters. But, if we’re dealing with the messy issue of how the whole country feels, and whether the UK should split up over Brexit, it’s probably a good idea to include as many people as possible. scale the voting turnout to opacity. Areas with lower voter turnout will be more transparent and therefore de-emphasised. adjust the colour scale (which was 20–80% in the previous plots) to the full range of 0–100%. The map will have less contrast, but this way only the strongest results will be strongly coloured. add a background green colour that corresponds to a 50/50 result. Areas that are equally split will start to disappear into the background. Leave areas will be darker than the background; Remain areas will be lighter. And this is what we get. It’s a bit of a mess really, isn’t it? 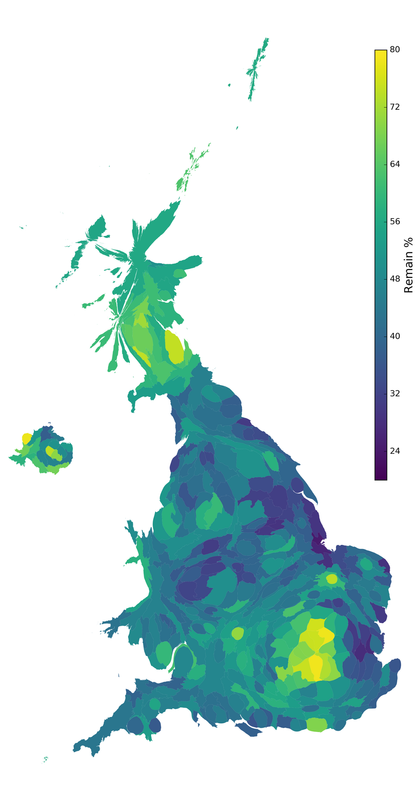 Nonetheless, this map contains the most information of any single Brexit result map (continuous scale, population density, voter turnout) I’ve seen. If the map isn’t distinct and obvious, it’s because the results aren’t either. The more information you add, the closer you get to reality, and the less clear the picture becomes. There has been speculation about how the results of the Brexit vote could precipitate the collapse of the United Kingdom. A second Scottish IndyRef has been mooted, along with the idea of London becoming a city state, a move to a more federal UK, and Irish reunification. So, let’s look at the data and see if we can gain a deeper understanding of the voting patterns in the different countries that make up the UK. 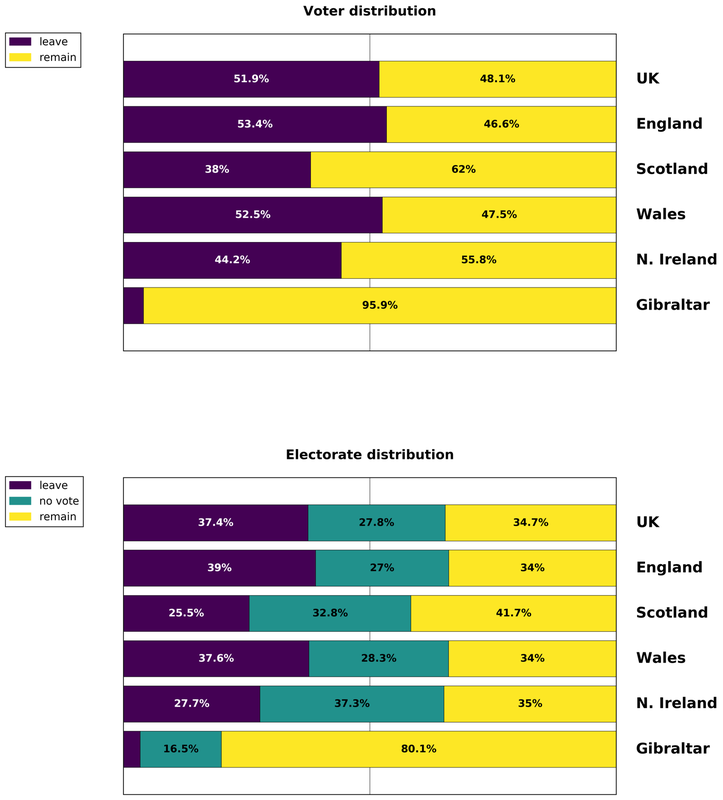 Here we have the distribution of votes from the UK overall, the four Home Nations and Gibraltar, in terms of a) percentage of voters and b) percentage of the eligible electorate. Gibraltar is clearly out on its own, being staunchly Remain and having a very high turnout. 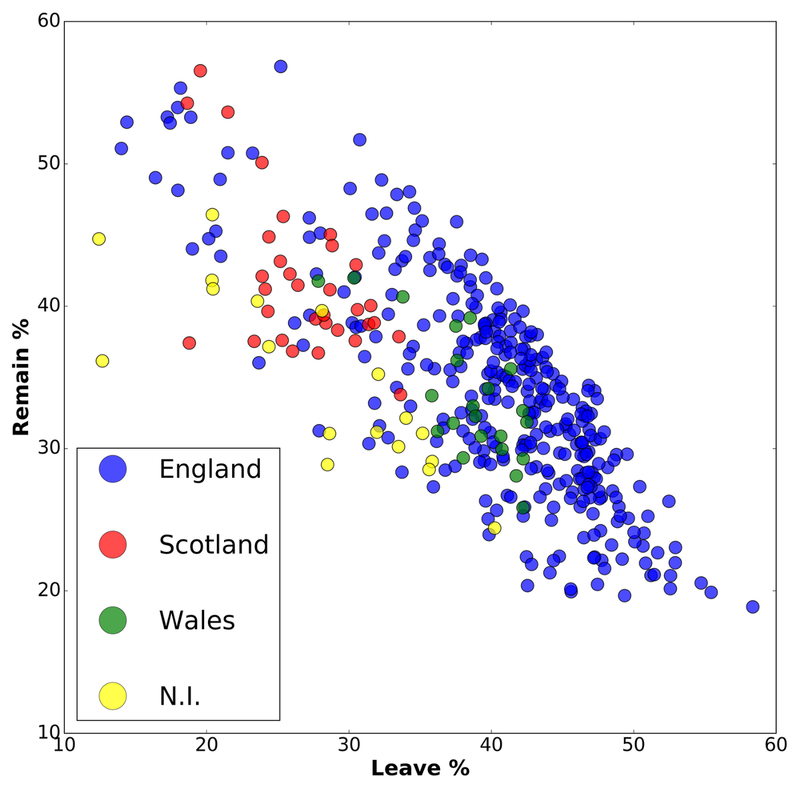 Looking at the four Home Nations we can see that the distribution of Leave, Remain and non-voters in England and Wales pretty much match the overall UK result (not a huge surprise given England’s population dominates the UK). Wales has the same percentage of Remain voters as England, and only slightly less Leave support. Northern Ireland, interestingly, has a similar Remain percentage to the UK/England/Wales, but has far fewer Leave voters, and a lot more non-voters. In fact the largest block of voters in Northern Ireland is non-voters. Scotland has the lowest Leave and highest Remain vote (outside Gibraltar). However, almost a third of Scots didn’t vote (compared to 28% in the UK overall). Let’s have a quick look at each voting area individually. Map 4: Brexit result areas where a majority of the electorate voted Leave or Remain. If a majority of the people (more than 50% of the eligible electorate) voted Leave the area is coloured purple, if a majority voted Remain its colour is yellow, and if neither side had a majority the colour is set to green. Ugh. There is a lot of green — in most areas the winning result was voted for by less than 50% of the people. From the table of voter distribution above we can see the voting patterns of the Home Nations, when viewed at a country-sized scale. But what about all the individual areas? The colours represent each area’s parent country; blue for England, red for Scotland, green for Wales and yellow for Northern Ireland. If the countries voted differently, they would appear as separate clumps of different colours. And… they sort-of-kind-of do. Many English areas certainly form a large clump (although many other areas are scattered throughout). The Welsh areas are mostly mixed in as expected, but without the higher-end Leave votes present in England. Scotland’s areas are clustered above and to the left, with Northern Ireland’s a bit more scattered and lower than Scotland’s. So, what would happen if we decided to make four new Home Nations, basing our decision entirely on the Brexit result? Let’s assign each area to one of four new “countries” (which I’ll imaginatively call Zone 1, Zone 2, Zone 3 and Zone 4) using a k-means clustering algorithm. Now we can see where these zones would be geographically placed on our map. In terms of Brexit ideology, Zones 1 & 4 represent stronger Remain and Leave support respectively with Zones 2 & 3 representing more lukewarm sentiments. In terms of continuous land mass with common Brexit sentiment, three areas stand out to me. 1. Scotland as a whole. The lone exception is the Moray area, which has one of the closest voting distributions (33.8% Remain, 33.6% Leave, 32.6% non-vote) in the country. 2. The mid-east of England is very distinct, with a large contiguous chunk belonging to our hypothetical Zone 4. 3. The London area, which has numerous contiguous areas belonging to Zones 1 & 2, and also represents a large population. Wales doesn’t stand out very much, and Northern Ireland is a mixed bag indeed. What does all this tell us? Well, for one thing I think we can probably all agree that one map does not a referendum make. The same data can be presented in different ways to tell different stories. In terms of UK political cohesion, concluding remarks are more difficult to come by. 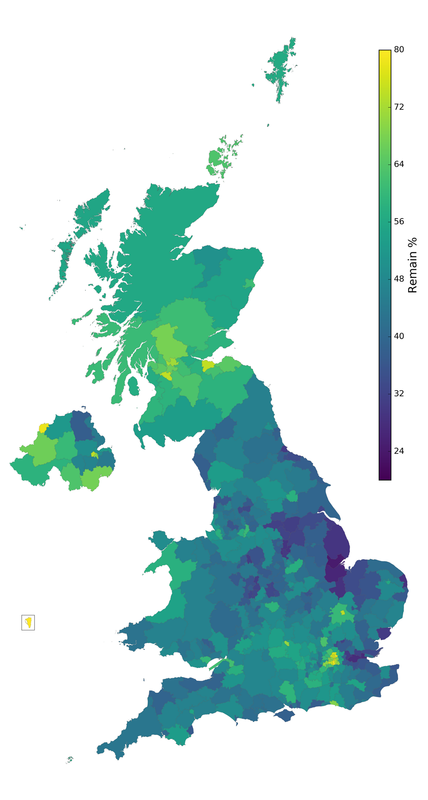 The maps and data show a real difference in voting sentiment between different areas of the UK. The mid-east of England has a large swathe of strong Leave feeling. London has a huge population of Remain voters. And — in addition to notable Remain support — Scotland already has distinct geographical and political differences, as well as a strong independence movement. However, perhaps the most significant (and depressing) thing I noticed while exploring this data is the effect of the non-voters. Their ghostly influence is writ large on Maps 3 & 4, and casts doubt on any firm conclusions you might wish to draw. Life is messy, and so is data. Python3 [pandas, numpy, matplotlib, fiona, shapely, descartes, scipy, scikit-learn, viridis colourmap], pyCharmCE, Pixelmator and QGIS.